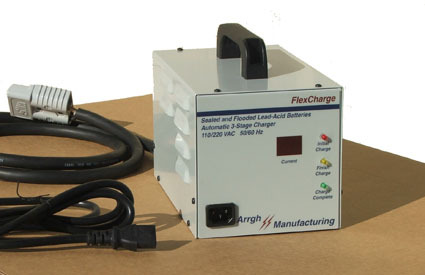 Automatic, software-controlled SCR chargers for both sealed and flooded lead-acid batteries. Charge flooded and sealed batteries with one charger. Protect batteries from under-charge and over-charge. Switches to float mode when charge complete. Soft-start reduces inrush current and noise on A.C. lines. Self-adapting A.C. input for domestic and international markets. Temperature compensated for cold-storage conditions. Finish charge at constant voltage. Soft-start and maintained float mode. Self-adapting, universal A.C. input (110/220 VAC 50/60 Hz). LED indicators for charge status and fault conditions. 1000 Watt 11" x 7" x 7" 28cm x 18cm x 18cm. 500 Watt 10" x 6" x 6" 26cm x 16cm x 16cm. 1000 Watt 37 lbs. 17 kgs. 500 Watt 29 lbs. 13 kgs. Single-phase, self-adapting 110/220 VAC 50/60 Hz supply. 12 / 24 / 36 / 48 volts. Variable-speed -- proportional to output current. -20C to 40C (-4F to104F). D.C. front / A.C. back. IEC connector for A.C. in back with 10-foot 16-3 power cable. 6 foot D.C. cable with SB50 connector in front. D.C. back / A.C. front. IEC connector for A.C. in front with 6-foot 16-3 power cable. SB50 connector for D.C. in back. (cable available at additional cost). Interlock available at additional cost. Designed to UL / CUL.